Tue., 24 Dec. - Mon., 27 Jan. Mon., 23 Dec. - Mon., 27 Jan. 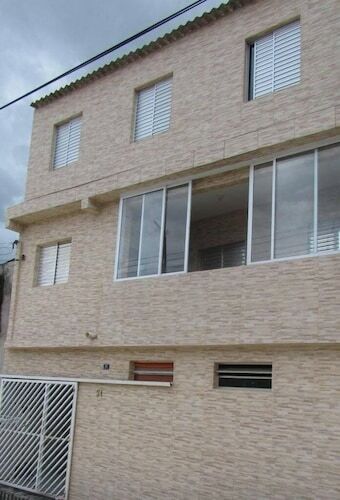 Tue., 31 Dec. - Tue., 28 Jan.
See all 162 properties in Guarulhos - Governor Andre Franco Montoro Intl. Located in Aeroporto Internacional Governador André Franco Montoro, this hotel is 0.8 mi (1.3 km) from International Terminal Duty Free Shop and 2.7 mi (4.3 km) from CECAP. Adamastor Cultural Center and Poli Shopping Mall are also within 9 mi (15 km). Located in Taboão, this hotel is 7 mi (11.3 km) from Internacional Shopping Guarulhos and within 16 mi (25 km) of Expo Center North and Corinthians Arena. Anhembi Convention Center and Paulista Avenue are also within 20 mi (32 km). Located in Aeroporto Internacional Governador André Franco Montoro, this hotel is 1.6 mi (2.5 km) from CECAP and within 9 mi (15 km) of Adamastor Cultural Center and Poli Shopping Mall. IV Centenario Square and Hall Tree Corner are also within 9 mi (15 km). Situated near the airport, this luxury hotel is 3.6 mi (5.8 km) from Bosque Maia Park and within 12 mi (20 km) of Parque Shopping Maia and Salomon's Temple. Expo Center North and Corinthians Arena are also within 12 mi (20 km). 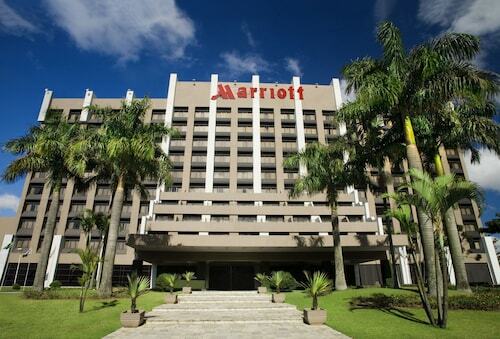 This family-friendly Guarulhos hotel is located near the airport, 6 mi (9.6 km) from Internacional Shopping Guarulhos, and within 12 mi (20 km) of Metro Boulevard Tatuape Shopping Center and Salomon's Temple. Shopping Center Norte and Expo Center North are also within 12 mi (20 km). 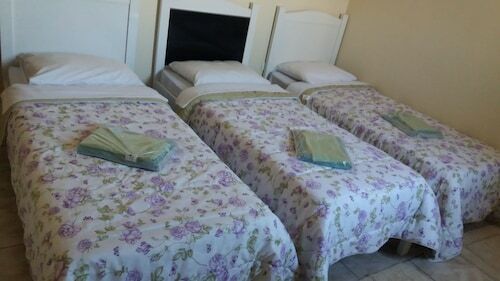 Located in Taboão, this hostel is 1.8 mi (2.8 km) from CECAP and 2.6 mi (4.2 km) from International Terminal Duty Free Shop. Parque Shopping Maia and Adamastor Cultural Center are also within 6 mi (10 km). 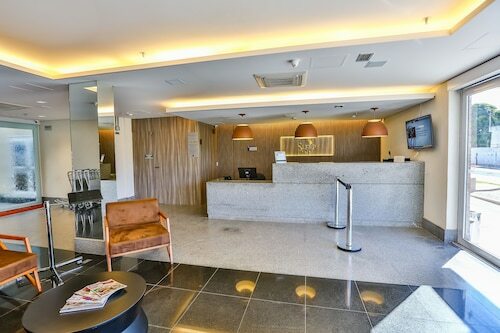 Situated in Guarulhos, this hotel is 2.2 mi (3.6 km) from Adamastor Cultural Center and within 6 mi (10 km) of Bosque Maia Park and IV Centenario Square. Parque Shopping Maia and Internacional Shopping Guarulhos are also within 6 mi (10 km). Located in Vila Barros, this hotel is 0.3 mi (0.4 km) from CECAP and within 3 mi (5 km) of Adamastor Cultural Center and Getulio Vargas Square. Bosque Maia Park and Poli Shopping Mall are also within 3 mi (5 km). Question : What is the cheapest date to fly to Sao Paulo? Answer : As of Apr 15th, the cheapest day to fly from Ottawa to Sao Paulo is Apr 27th. Tickets are presently $638, 63% less than the average price. Answer : Yes, you can change your departure or arrival date. If you wish to save a little cash in doing so, the cheapest day to fly in April is Saturday. You may be thinking you're missing out leaving a day earlier, but we think of it as you just adding saving towards your next trip. Question : How long do most people stay in Sao Paulo? Answer : Of course, you're not most people, but if you were, you'd stay around 11 days. Question : What is the cheapest airline flying from Ottawa to Sao Paulo? Answer : United Airlines is the leader in keeping prices down for their passengers over the next three months. Bookings are being made at just $638, which is a bargain when compared to the more expensive bookings of $6,600. Answer : The cheapest day to fly from Ottawa to Sao Paulo is on Saturday. If you are trying to save some cash on your next trip look for flights on that day. Question : How much is a plane ticket to Sao Paulo (GRU) from Ottawa (YOW)? Answer : Prices can vary anywhere from $638 to $6,600. Booking far in advance can typically help you get the cheapest rate. Remember, the sooner you book, the more you'll be able to save.